For the second night running at Prince Chichibu Memorial Rugby Ground, a late drop goal proved decisive as the Toyota Industries Shuttles opened their Top League campaign Saturday with a 9-8 win over the NEC Green Rockets. Just as Canon Eagles’ Yu Tamura was on Friday night, Christian Lealiifano was the personification of calmness under pressure as he slotted over a kick from 30 meters out to steal the win from the clutches of the Green Rockets. “That’s the first time in 11 years of professional rugby that I’ve won with a drop goal, though I didn’t see it because my face was in the ground,” said Shuttles captain Scott Fuglistaller. Fuglistaller was at the heart of a physical effort from the Shuttles as the teams adjusted to the increase in the number of foreigners on the field. “Both teams rolled up their sleeves in terms of physicality and the breakdown was intense,” said NEC head coach Peter Russell. 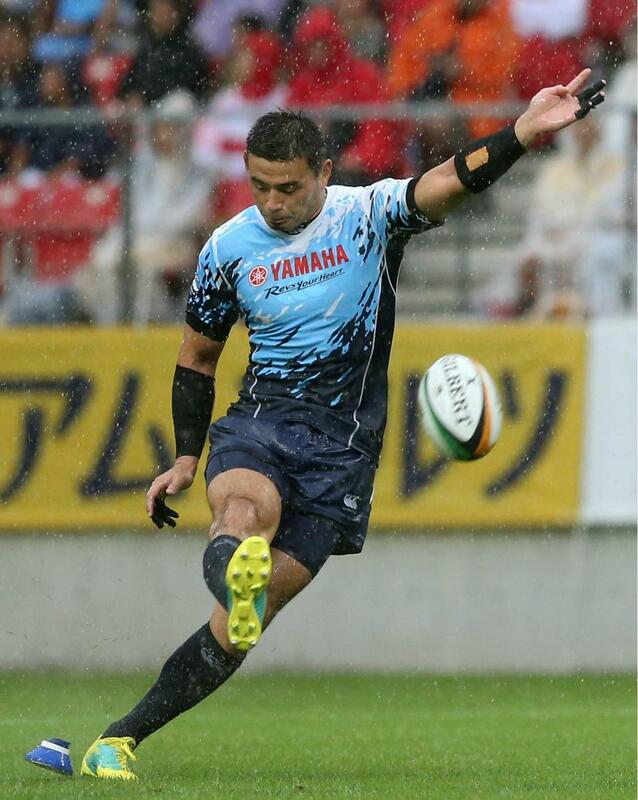 In the other afternoon game, Ayumu Goromaru overtook former Suntory Sungoliath center Ryan Nicholas as the most prolific scorer in league history as he kicked five conversions and a penalty goal in Yamaha Jubilo’s 43-3 win over the Coca-Cola Red Sparks. 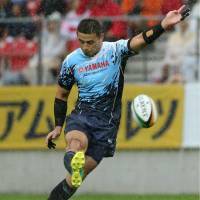 Goromaru, who made his debut in 2008, now has 1,195 points to his name. In the later games, a penalty try nine minutes after the final hooter helped two-time defending champions Suntory Sungoliath beat the Toyota Verblitz 27-25 in front of 31,332 at Toyota Stadium, the while Ricoh Black Rams edged the newly promoted Honda Heat 39-34 in a highly entertaining game in the second match of the doubleheader in Tokyo. Under grey threatening skies in Tokyo, a Stephen Donald penalty put NEC ahead in the ninth minute. Sam Greene pulled the sides level with a penalty in the 30th minute as both sides struggled to create any clear cut try scoring opportunities. The only chance that did arise came five minutes before the break when Greene and Lealiifano combined to put Siosifa Lisala away. But the Shuttles winger was brought down by the 35-year-old Donald, who famously helped New Zealand win the 2011 Rugby World Cup and then had a movie made of his exploits. A second penalty from Greene in the 43rd minute saw Toyota edge ahead. But that only fired NEC into action and Daiki Nakajima scored the first (and only) try of the game five minutes later when he scampered over from a scrum five meters out to make it 8-6. With Wallabies back-row forward Scott Higginbotham entering the fray, NEC suddenly had a lot more go forward and Donald should have increased the lead with a simple penalty that hit the post. Donald then belied his years with a searing break that almost saw him score his side’s second try as the Shuttles spent much of the half on the back foot. But they rode their luck, with Donald missing another penalty before Lealiifano slotted over his drop goal a minute from time to seal the win.